No documentation survives of Theophilus Grew’s birth, education, and early life. He first appears in the historical record in the early 1730s, when he had the astronomical skills to calculate and prepare almanacs, probably in Maryland. His first known almanac, The Maryland Almanack for the Year…1733, was published in Annapolis in 1732. Later his almanacs were published in Philadelphia, New York, and Willliamsburg. The earliest extant newspaper advertisement identifying Grew as a schoolteacher appeared in Philadelphia in 1734. In his Philadelphia school he taught mathematical subjects, including basic arithmetic as well as such academic and practical applications as surveying, navigation, astronomy, accounting, and the use of globes. After serving as a headmaster in Chestertown, Kent County, Maryland, from 1740 to 1742, he reopened his school in Philadelphia. This school for boys, located first on Walnut Street and then in 1744 in Norris Alley, included English, but emphasized mathematics. It also included a night school offering mathematics for gentlemen. Besides his teaching, Grew also in 1749 published a description of an approaching eclipse of the sun, and the following year served as one of the commissioners from Pennsylvania establishing the boundary between Pennsylvania and Maryland. Grew’s most important publication was his student text, The Description and Use of the Globes, Celestial and Terrestial; with Variety of Examples for the Learner’s Exercise (a copy of which was presented to the University Library in 1905). 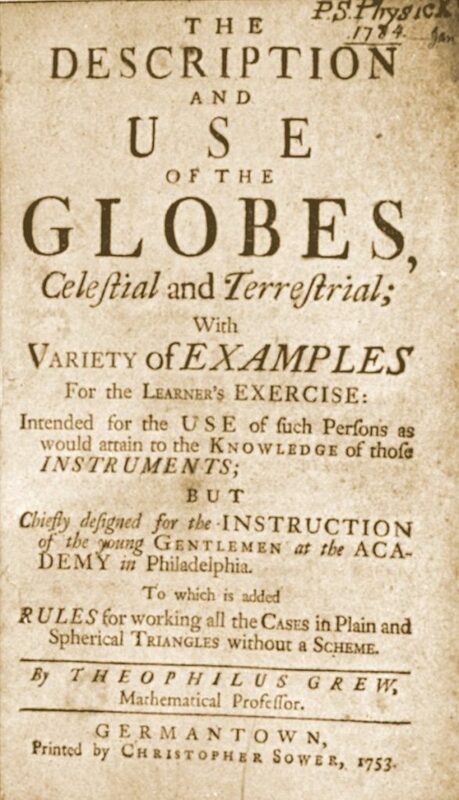 This 1753 book was the first textbook by a member of the Penn faculty as well as first student text on the use of globes to be published in the American colonies. For his contributions to knowledge, he was awarded the honorary Master of Arts degree at the 1757 commencement. Grew married Elizabeth Cosins in 1735, and then after her death, Frances Bowen in 1739. After his second wife died, he married Rebecca Richards in 1747. Grew entered his son Theophilus in the Academy in 1751. He served as Penn’s mathematics professor until his death from consumption in 1759.